Our cameras have made further visits to the Isle of Wight to capture the atmosphere of the local bus transport scene. 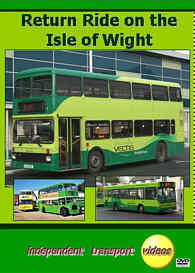 The first part of the programme shows the current operations of the island’s major bus operator – Southern Vectis. Now under the management of the Go Ahead group it is introducing a new smart livery and image of two tone green. We start our film at the busy Ryde bus station on the August Bank Holiday weekend 2006. Open top Bristol VRTs are seen starting their work for the day. 2006 is the last season for some of these familiar vehicles that have operated on the island for some 37 years. Other members of the fleet are in the new livery, some still wearing the previous red of ‘Route Rouge’ and blue of the ‘Explorer’ scheme. Single deckers are in the old dark blue and others in an interim style of green. Moving to east Wight we visit the holiday resort town of Shanklin and film the VRs running up and down the steep hill that leads to the sea front. We take a lower deck ride to Sandown on Bristol VR 504 (WDL 655) to capture the familiar sights and sound of these buses. At Sandown we film the action on the streets of various types in service before a return ride to Shanklin on board Bristol VR 503 (XDL 872). More scenes are filmed out and about on the island’s picturesque roads. The second part of our programme visits three ‘Running Days’. The first in October 2004 is to celebrate 75 years of Southern Vectis. Based at the company’s Ryde bus depot there were plenty of interesting vehicles, both island residents and visitors from the mainland. We take rides on a Bristol RESL 808 (HDL 23E) and open top Bristol LD 500 (MDL 954). The second running day is 2005, again featuring many vehicles and rides, finally highlights of the 2006 Running Day are recorded – here we take a ride on open top Bristol K5G 703 (DDL 50) and also Bristol LD 500 (MDL 954). So buy your return ticket and have some more rides on the Isle of Wight.